This is an absolute treasure trove for a fossil and dinosaur loving little one!! I can't believe I had never been here before now - we have already been twice and Amelia asks to go there every time we are in Cambridge. Most of the museums in Cambridge have free entry, and are a lot more impressive than you would imagine! 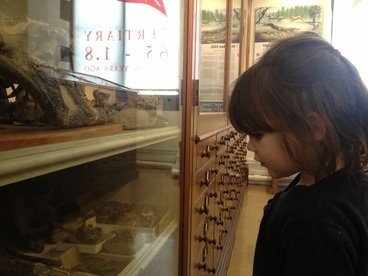 The Sedgwick Museum has a wonderful collection of fossils, rocks and minerals, and skeletons. Most of the collection was discovered locally, and it is sorted into chronological order, with clear displays. The cabinets are all easy to see, and the ones that are higher up are accessible by a stepping stool (they have several available). There are interactive displays that you are encouraged to use, including some fantastic puzzles and a match the fossil game, where you are allowed to hold the fossils.